But summer berries are indeed wonderful with local, pastured duck. There are several very good duck farmers in the NYC area and their ducks make ideal main courses for nicer gatherings. The meat is rich though and the sweet and gloppy sauces that often accompany duck dishes makes the dish even heavier. Better to go with a simple pan sauce of fresh, local berries that will let the flavor of the duck come through. One farmer at the Union Square Greenmarket sells a breed called ‘lola’ which is lower in fat but has a much meatier flavor. For a summer duck entrée, a roast lola duck is perfect. I do like to brush the duck with a sweet mixture to help with browning and I use whatever farmers’ market jam I have on hand cut with a little water. Not a difficult step but one that makes the finished dish crispier and more pleasing to the eye. 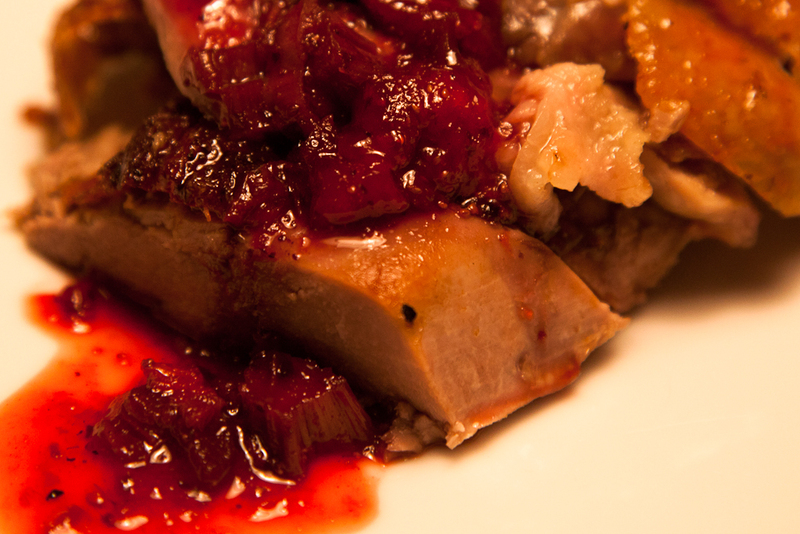 To serve, carve duck as you would a chicken or turkey and spoon berry mixture over meat. I like the thighs the best but it’s all good. Thanks so much to my friend Francesco for the great photo. You can see more of his work at francescobertocci.com. Well hello Kosher readers! 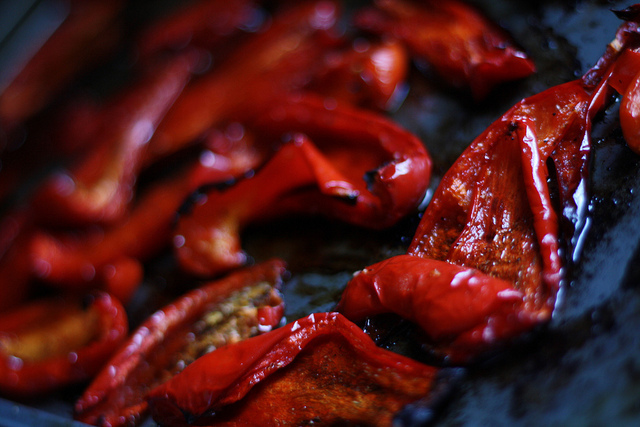 While I love the insightful comments you’ve been sending in about my Jewish dishes, I’m not sure this recipe is for you and perhaps you should come back next week for a recipe you might like better. Pork and shellfish can range from good (bacon wrapped scallops at an office party) to great (Portuguese Clam Stew with Tomato and linguiça) to exquisite (Spanish Paella with Clams and Chorizo). But whatever the specifics of the dish, there is something exciting about the brininess of shellfish with some rich pork mixed in. I don’t keep Kosher although my grandmother taught Kosher cooking at one point and many of my friends keep Kosher now. Growing up, we never ate Christmas or Easter hams even though I always knew they were tasty. Now I have no problem serving pork in my home, provided it comes from a local, small operation with extraordinarily high animal welfare standards. I think Tamarack Hollow fits the bill and they make a ham that is simply life changing for most of my guests who have tried it. But for some reason, I don’t serve ham all that often and when I do, I rarely save the bones. But the bones themselves are so full of flavor and nutrients that it would be wrong for a true Home Cook Locavore to pitch something that could so easily be used to make another meal. 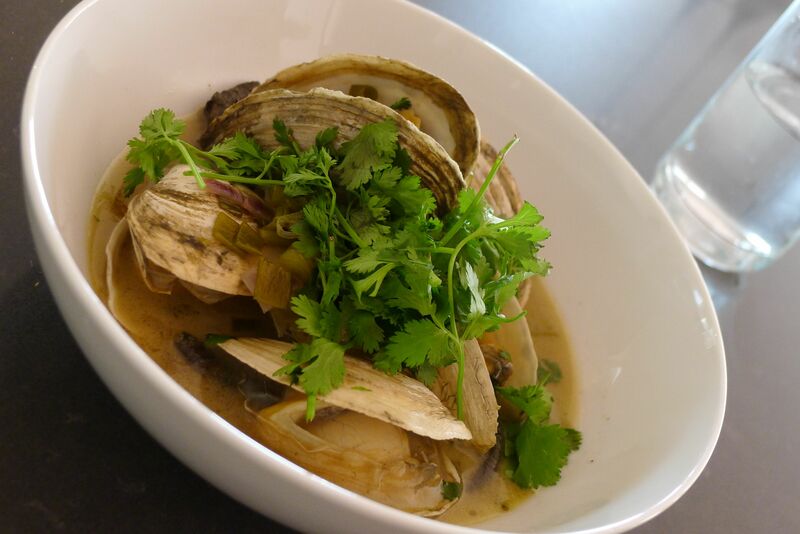 But what really inspired this dish, were the glistening steamer clams from Pura Vida out of Long Island. These clams rivaled those from Northern New England and begged to steamed and eaten. So 2 dozen steamers were on their way home and a ham bone sat in a bowl in the fridge along with some old carrots and an onion or two. While not the usual method of bringing shellfish and pork together, why not make a ham broth and then steam the clams in it making an even brinier and more delicious broth to serve with the clams? A squeeze of lime and a sprig of cilantro brightens up the dish and gives it an almost palate cleansing quality after each bite. I noticed some great looking Kosher short ribs at the market this week and I’m looking forward to trying some new recipes. For now though, it’s time for pork, shellfish, and some very nice weather. A little bitterness is ok. It’s not so good in relationships, after elections, or in the workplace, but it’s fine in a good Manhattan or tossed with pasta and some leftover chicken. In fact, pastured dark meat chicken is so meaty that a good bitter green really balances the dish. There might be another version of this dish to be made with white meat chicken and a more neutral green like spinach but for me, it’s better go for the fuller flavors. Escarole is available now at many farmers markets but if you have trouble finding it, you could easily substitute mustard greens, ramps, or even arugula. Talk to your farmer. It’s a fun way to do your shopping. It’s important to stretch farmers market proteins. They are far more delicious than almost any meat to be found shrink-wrapped at the supermarket, but they are also more expensive. There are many reasons for this, most of them related to the higher land and labor costs of smaller scale, responsible farming. but as a home cook, it’s not hard to bring the cost per meal down by doing some creative things with the leftovers and possibly changing your cooking and eating style a few nights a week. (Here is an earlier post about making farmers market chicken more affordable). Lately, I’ve been enjoying the ‘leftover meals’ even more than the more protein-heavy ones. It might be the season, or it might be the fun of making such tasty meals in such a short amount of time and for so little money. I’m not sure. It didn’t even bother me that I wasn’t invited to the roast chicken dinner that my neighbors threw last Thursday. Actually, that might just be sour grapes. Or bitter ones. It doesn’t matter. This dish is yummy. Fast food Mexican food can be tasty but sometimes I don’t want to think about the 45% ‘real’ filling or wonder when the meat hose was last cleaned out. But tostadas can be fresh, light, and made with local ingredients. 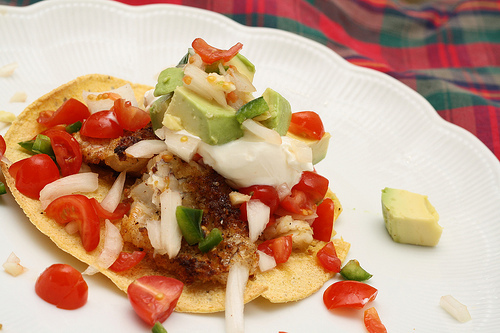 If you have good seafood available locally, fish tacos or tostadas can be a fast and delicious weeknight meal. I first tasted really great fish tacos in Los Angeles where people go so far as to wait in line for half and hour for a hand-pressed tortilla with perfectly fried fish and cabbage slaw on top. Those tacos are truly things of beauty. For the home version, I thought it might be better to saute the fish in a pan with some breadcrumbs instead of deep-frying. It makes the dish lighter and the cleanup easier. I found a small fillet of mangrove snapper that had been caught that morning and I had some leftover tomatoes, onions, and poblano peppers from the farmers market as well as half a Florida avocado. I also keep tortillas in the freezer for nights like this. This works with almost any light fish. I’ve done something similar with tilapia and flounder and the results are just as wonderful. Similarly, feel free to chop up whatever vegetables you have around and throw them in the salsa. It will all be good. And when you sit down to enjoy your meal, possibly with a margarita or beer in hand, you can rejoice in the fact that you put a light and local Mexican meal on the table without ever using a meat hose. Just as I probably wouldn’t classify the movie Airplane as a tragedy, I probably wouldn’t call any dish that includes bacon vegetarian friendly. But many of the problems caused by our typical American diet stem not just from the fact that we eat meat but the fact that we eat so much of it and cutting back might be a good first step. There are plenty of 16 oz steaks on menus all over the place. And yes, they can be delicious. Lots of books about diet and sustainability suggest cutting meat serving sizes down to 3 or 4 ounces. Many times, I find myself hungry after such a small serving. But what if I found perhaps the most delicious and richest meat to cross my palate in a long while? What if it came from a small farm in Florida and had been cured by a man very passionate about bacon? That’s a different story. The NY Times ran a story about a breed of pig called Mangalitsa that produces incredibly buttery, rich meat. Truthfully, this was something I had wanted to taste in NYC for quite some time but had not been able to find. So I was pleased when the gentleman who runs the Transatlantic Sausage Company at the farmers market in Sarasota offered me a small package of Mangalitsa bacon. 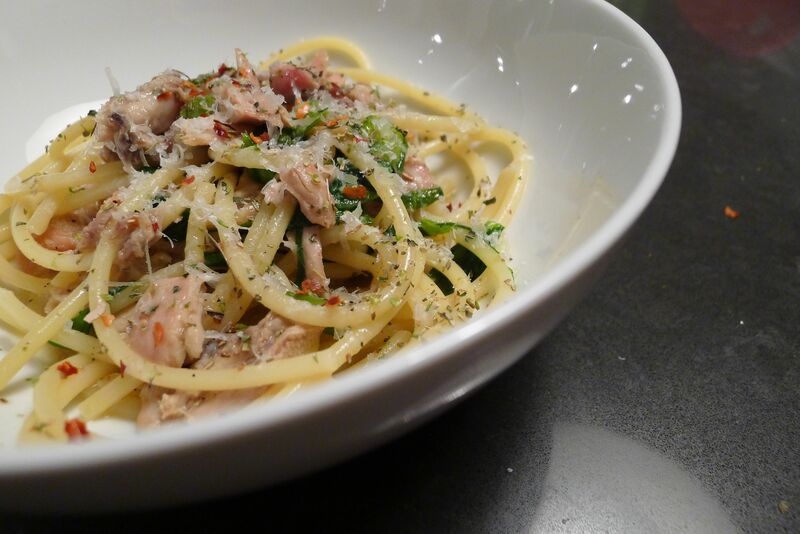 He compared it to Italian pancetta or guanciale, both of which you might have tasted if you’ve ever eaten an authentic carbonara. It’s pricey by the pound but it’s used in such small quantities that the cost per serving is lower than a fast food meal deal. The same week I saw the bacon, I noticed a stunning bin of cranberry beans. 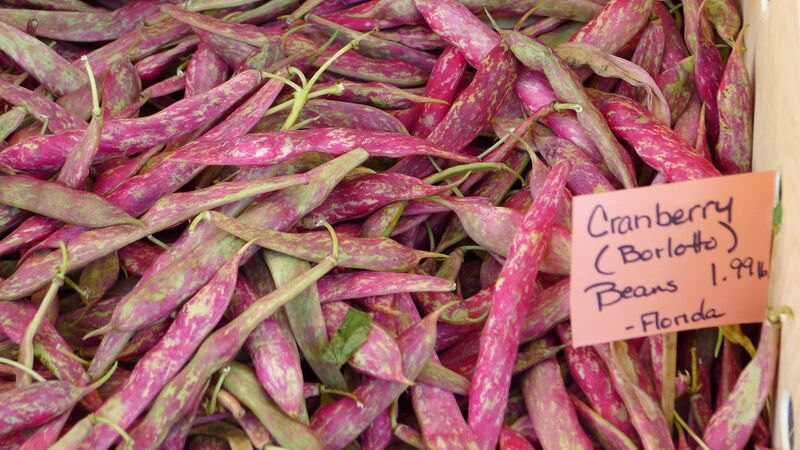 Cranberry beans are beautiful at every stage; at the market, after they’re shelled, in the cooking water, and on the plate. I posted a recipe for Fava Bean Crostino last spring and the prep is very much the same but they only need to be shelled once. They are sometimes called ‘shell beans’ and have an almost nutty flavor. I ended up serving the pasta for guests who were used to eating meat. Plenty of meat. But instead of a 5 or even 6 oz serving of meat per person, I used a grand total of 2 ounces for 4 of us. The dish was rich and meaty and satisfied the inner carnivores in all of us. The bacon was smoky and earthy and the beans themselves were hearty in a fresh and sort of ‘snappy’ way. I love using the Seafood Watch program on the Monterey Bay Aquarium website. It’s a great tool for figuring out what seafood is the most sustainable based on the type of fish, the country of origin and on whether or not it is wild or farmed (some farmed choices are indeed better). 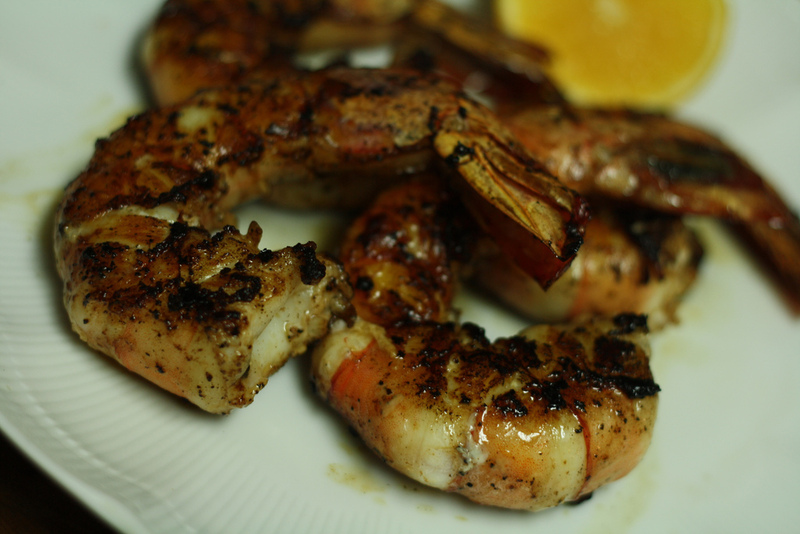 I love shrimp but there are serious problems with most of the shrimp from overseas. Gulf Shrimp though? The sweet and near-perfect looking specimens found along Florida’s Gulf Coast are not only some of the most delicious shellfish I’ve ever tasted, they are among the most sustainable as well. So it’s time to wave the American Flag and start buying American when we want shrimp. I’m surprised there hasn’t been a Toby Keith song or at least a talk-radio segment about the importance of buying American shrimp. In fact, I think we wasted far too much time making fun of arugula-eaters as being out of touch. Perhaps it is those buying shrimp from 10,000 miles away we should be taking a look at. They might be the real socialists. Fresh and local citrus is also very good in Florida. It’s sweeter, nicer looking, and I’m certain healthier than what we get in our supermarkets in the North. Oranges and grapefruits are good for breakfast but because $4 buys you a very large bag of them, I wanted to find some other uses for them as well. The jumbo prawns are on the pricy side. They’re going to run you around $8/serving. That’s more than many of the proteins I write about here but still less than most entrees in a mediocre restaurant. So drape that American flag around yourself and get yourself some Gulf Shrimp. You’ll be happy with your meal I’m certain. Also, it will keep people from thinking you’re a communist.